The Greek struggle for independence lasted from 1821 to 1829. Many different flags were used by the Greek forces during the fight against the Ottomans. Some of these flags had already been used in localized insurrection movements before the general uprising of 1821-22. Similar insurrection flags were used on the Greek islands. The independent state of Greece was proclaimed in 1822 and national flags were officially adopted. However, the fight against the Turks lasted until 1829. After the independence, Greece attempted to incorporate all areas inhabited by Greeks and the definitive borders with the neighbouring countries were stabilized only in the mid-1920s. Insurrection flags used in that context are shown elsewhere. A white flag with a blue cross is known to have been used by forces connected with the Kolokotronis family, as well as the Cypriot forces of Hadjigeorgios. It was also used by the forces of Mellissinos Makarios after (perhaps during) the 1769 revolution. This probably does not exhaust its usage. As such, it was perhaps the most widely used Greek revolutionary flag. Nevertheless, a different national flag was adopted by the provisional government. Alexander Ypsilantis (1792-1828) was a Greek who served as a general in the Russian Army. He was the leader of the political movement called Philiki Etairia (1820-1821) and led an invasion of Moldavia in an abortive attempt to liberate the Balkans from Ottoman rule. Ypsilantis' flag is horizontally divided red-white-black. Black: the death of the Greeks for country and freedom. ΕΝ ΤΟΥΤΟ / ΝΙΚΑ (In this sign / thou shall conquest). The reverse of the flag shows a phoenix emerging from the ashes. It was the flag of Alexander and Demetrius Ypsilantis. The members of the Sacred Battalion and Georgios Olympos, heroes of the Greek independence struggle, fought and died under this flag. 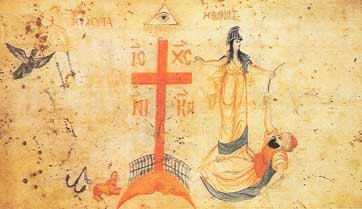 On 21 March 1821, Andreas Londos flew a red flag with a black Latin cross resting on a white crescent, with horns down. The reverse of this flag is reported as plain red. Replica, Historical and Folklore Society of Acharnae. the main motto of this war and the current national motto of Greece, is horizontally written, in black, in the lower part of the flag. Andreas Miaoulis (1769-1835) was born on the island of Hydra. At the age of 17 he became captain of a commercial ship. During the Napoleonic wars he managed, due to his courageous sea operations, to accumulate considerable wealth. From the second year of the revolution he was appointed Admiral of the Greek fleet. He defeated the Turkish navy near Patra and the Turko-Egyptian navy near Geronda, and on many occasions he was able to provide supplies for Greek cities besieged by the Turks (e.g. Mesologi). The flag used by Nikitaras, from his real name Nikitas Stamelopoulos (1782-1849) is shown in the National History Museum in Athens. This flag was used by the Greek guerillas against the Ottoman occupation during the independence war (1821-1829).